As of 2005, the Navajo Nation has banned uranium mining on their land. However, due to the large supply of uranium under the Navajo Reservation companies have been trying to re-open mines. Liabilities remain. The lands of the Navajo Nation include 27,000 square miles spread over three states, Utah, Arizona and New Mexico. The geology of these lands makes them rich in uranium, a radioactive ore in demand after the development of atomic power and weapons at the close of World War II. 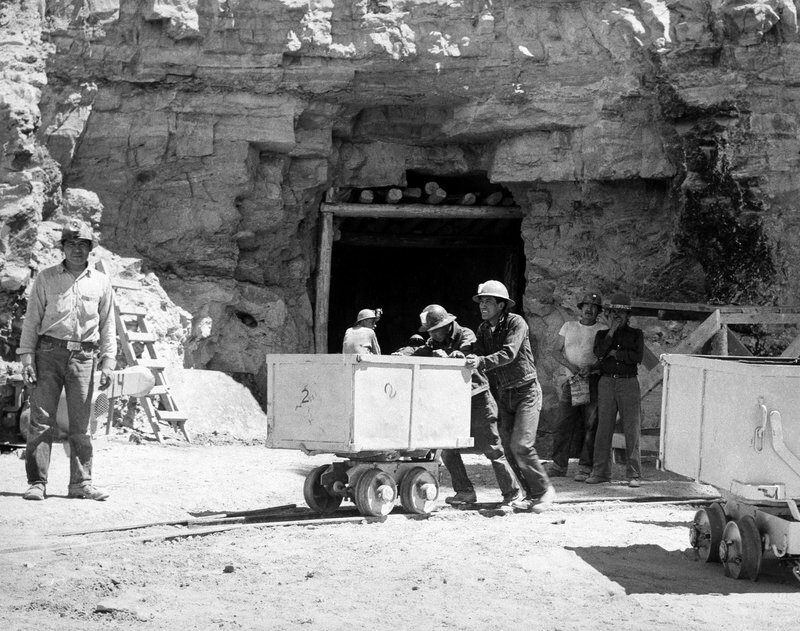 From 1944 to 1986, nearly four million tons of uranium ore were extracted from Navajo lands under leases with the Navajo Nation. Many Navajo people worked the mines, often living and raising families in close proximity to the mines and mills. Today the mines are closed, but a legacy of uranium contamination remains, including over 500 abandoned uranium mines (AUMs) as well as homes and drinking water sources with elevated levels of radiation. Potential health effects include lung cancer from inhalation of radioactive particles, as well as bone cancer and impaired kidney function from exposure to radionuclides in drinking water (U.S EPA). The Navajo people, due to a language barrier and limited education, were largely isolated from the flow of knowledge about radiation and its hazards . Mobilization began in reaction to several mill spills and continuing health effects from mine tailings. While there was resistance, those being affected were not listened to and did not have adequate resources to create a large opposition. As journalist Judy Pasternak recounts, a few outstanding individuals - among them Navajo schoolteacher Lorissa Jackson, former Interior Secretary Stewart Udall, his son Tom (now Sen. Udall, D-N.M.), and U.S. Rep. Henry Waxman - helped raise awareness and made a stand against one of the grossest cases of betrayal and willful oversight in the history of the country. Another voice in the fight against this injustice was Harry Tome, a tribal council member and later employee of the minerals department of the tribe, was one of those who noticed the problem in the early 1960s. In 1973, Tome prompted the Albuquerque Tribune to run a cover story that led to the first legislation in the U.S. Congress aimed at compensation focused on benefits for uranium miners. The bill never passed but in 1978, Tome began working with Udall who filed two lawsuits in 1979 seeking damages for uranium miners . After a 30-year fight, with multiple dismissed class-action lawsuits, Congress responded by developing a program allowing partial restitution to individuals who developed serious illnesses after exposure to radiation released during the atmospheric nuclear tests or after employment in the uranium industry: the Radiation Exposure Compensation Act (RECA) was passed on October 5, 1990. This program was designed to serve as an expeditious, low-cost alternative to litigation . Notably, it did not adequately compensate affected individuals and Navajo members continued to push for compassionate compensation that would allow them to pay medical bills and provide comfort following the loss of family members. The U.S. Justice Department announced on March 2, 2015, that it has awarded more than $2 billion in compassionate compensation to eligible claimants under RECA . EPA’s cleanup work continues under a second 5-year plan developed in 2014. In 2015, Federal and Navajo agencies formed the Community Outreach Network as part of the Five-Year plan. The Community Outreach Network includes representatives from EPA, the Bureau of Indian Affairs, the Nuclear Regulatory Commission, the Department of Energy, the Indian Health Service, the Agency for Toxic Substances and Disease Registry, the Navajo Nation Environmental Protection Agency, the Navajo Nation Abandoned Mine Lands/Uranium Mill Tailings Remedial Action Program, and the Navajo Nation Department of Health. The Community Outreach Network plans and coordinates outreach events to enhance community understanding of the work agencies are doing to address uranium contamination on Navajo Nation . As of 2005, the Navajo Nation has banned uranium mining on their land. However, due to the large supply of uranium under the Navajo Reservation companies such as Hydro Resources, Inc (HRI), have been trying to re-open mines. HRI, Inc has proposed to mine a site through an in-situ leaching process which will result in total radiation levels nine to fifteen times the permitted regulatory limit . The proposed mines could contaminate the sole drinking water source for 15,000 Navajo citizens . On December 15, 2015, the State of New Mexico Environment Department terminated HRI’s groundwater discharge permit 558 because it did not comply with groundwater permitting regulations of the Water Quality Control Commission (WQCC). HRI was encouraged to apply for a new permit in accordance with the new water quality standards that had been lowered from 5 mg/l to .03 mg/l in 2004 . A lot is at stake in this on-going case, namely the quality of millions of gallons of drinking water that would most likely be contaminated as a result of HRI’s proposed in-situ mine. Navajo members continue the fight to protect their land, their health, and their future. Project Details To date, 4 million tons of uranium ore has been extracted, however 70 million tons remain under the Navajo Nation. The Navajo Nation still have over 1,000 abandoned mines that continue to produce land and water contamination. A 1979 spill at Church Rock dumped 94 million gallons of mill process effluent and 1,100 tons of tailings that contaminated the Puerco River. An estimated 10 000 workers were employed in uranium mining, and about a quarter of them were Navajo. About 40% (3975) have applied for compensation as of March 21, 2001. The Hydro Resources, Inc (HRI) in-situ mining operation would contaminate the pristine aquifer which supplies drinking water to more than 10,000 – 15,000 Navajo citizens. Other According to the EPA, potential health effects include lung cancer from inhalation of radioactive particles, as well as bone cancer and impaired kidney function from exposure to radionuclides in drinking water. Why? Explain briefly. No, the effects of decades of mining have caused significant health effects as well as poverty and loss of cultural/traditional land. The threat of uranium mining continues despite actions by the Navajo Nation to protect their land and people from the effects of uranium mining. Judy Pasternak, Yellow Dirt. A Poisoned Land and the Betrayal of the Navajos, Simon and Schuster. ("This investigative feat tells the shocking, heartbreaking story of uranium mining on the Navajo reservation and its terrible legacy of sickness and government neglect, documenting one of the darker chapters in 20th century American history"). Blowing in the Wind: The Navajo Nation and Uranium; Jovana J. Brown, PhD and Lori Lambert, PhD, DS, RN, (2010), The Evergreen State College. "Uranium Mining in the Navajo Nation after Hydro Resources, Inc."
NYT, "Uranium Mines Dot Navajo Land, Neglected and Still Perilous"
Other Comments This is one of the top 40 influential environmental justice cases in the United States identified from a national survey of environmental activists, scholars and other leaders by graduate students at the University of Michigan.